This way, you can bake your favorite cakes, smear a bit of this yummy frosting on top, and declare them "honey cakes" without fear of contradiction. This recipe makes 2-3 cups of pareve honey frosting, which can be drizzled on top of carrot cakes, spice cakes, quick breads, or any not-too-sweet cake. 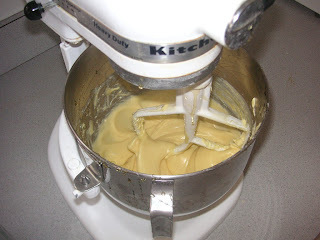 It can also be served as a "cake condiment" and smeared like a flavored butter onto the cake surface by each individual. 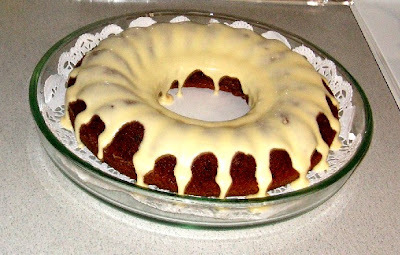 We like this as a pareve substitute for cream cheese frosting on a carrot cake. Because this frosting is thin and pourable (which suits it well, as a little goes a long way) it looks, tastes, and performs best when the whole cake (or at least the frosting) is served chilled. A double recipe of 5 cups of this frosting, chilling in the refrigerator, will transform a few weeks' worth of holiday cakes into "honey cakes", a few ladle-fulls at a time! Mix the soy milk and the honey with the margarine, adding the liquids slowly in small amounts, scraping the sides of the bowl and mixing well between each addition. Add the salt and the confection sugar and beat well. Stir in the brewed coffee. Chill and use sparingly. It will run over the sides of the cake if served at room temperature, so either serve immediately, or keep chilled. Oops - read the post, can't find the recipe? Thank you!!! I must have deleted it by mistake. You saved the day!